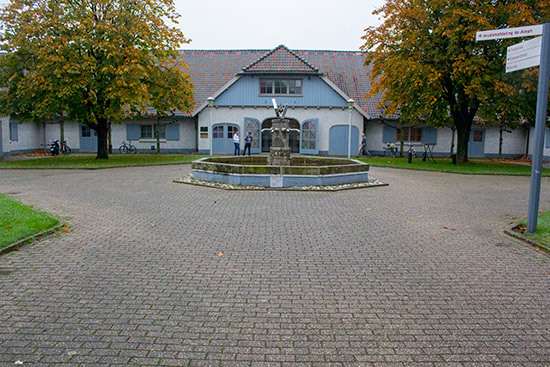 Location: De Voorste Venne, Afrikalaan 100, 5152 MD Drunen, Netherlands. 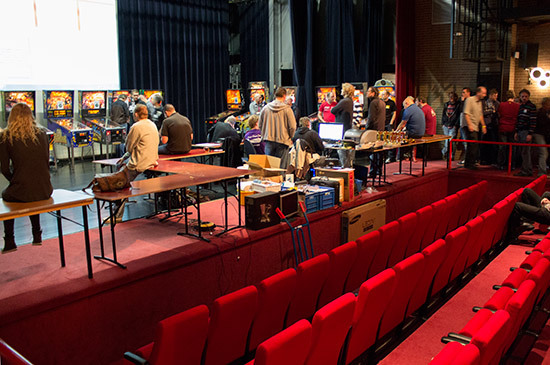 After many years in the central city of Amersfoort, the Dutch Pinball Open is now held in a different part of the country each year to give all members of the organising Dutch Pinball Association (NFV) a chance to visit it at some point. Following last year's event on the outskirts of Amsterdam, we in the south of the country near the city of Tilburg at De Voorste Venne - a former car museum now turned into an exhibition hall and theatre. Little remains of its former use, except maybe the central water feature made from chrome exhaust tailpipes. Inside, the building is divided in two. 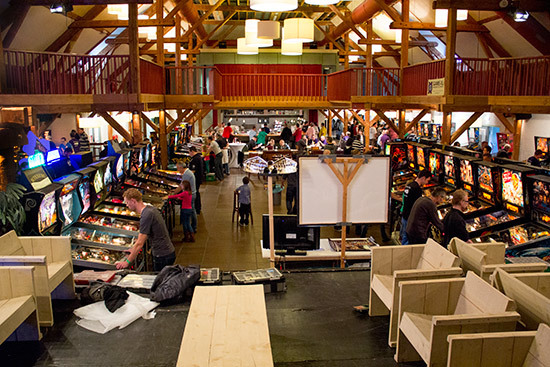 The larger area is a two level wood-framed hall which was used for the free play machines and the vendors. 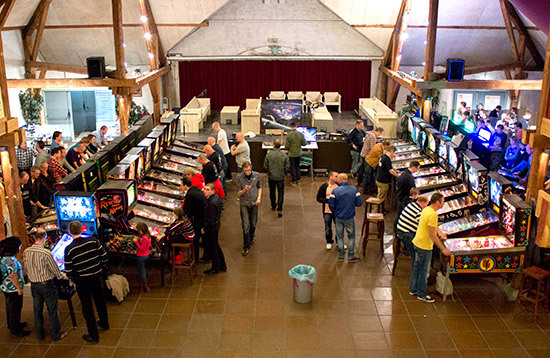 The second room is a theatre, complete with raked seating and a stage which was home to the Dutch Pinball Open tournament machines. But we'll start this report back in the main hall and at the entry desk. The doors opened at 10:30am on Saturday. Entry could be pre-purchased or bought on the door. Entry to the event for NFV member and foreign visitors cost €10 ($13.35, £8.35) for Saturday and €7.50 ($10, £6.25) for Sunday, with a weekend pass costing €15. Prices were €12.50/€10/€20 for non-members. Tournament entry cost €17.50 for the DPO, €7.50 for the Ladies Tournament, €3 per attempt for the Classics Tournament, while the Kids' Tournament was free to enter. 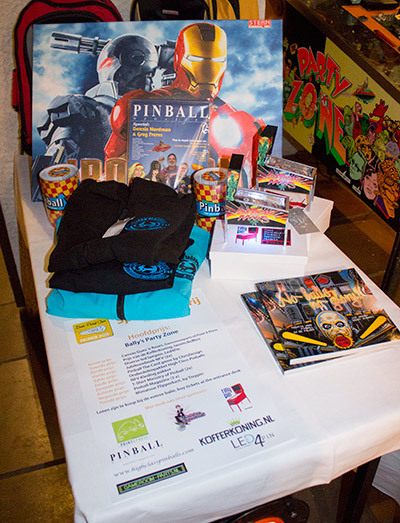 Those pre-registering had the chance to buy a package deal which included a T-shirt, raffle tickets, weekend entry to the show and entry in the main DPO tournament for €50 ($66.84). Outside the package, T-shirts cost €17.50 and raffle tickets were €3.50 each, €10 for 3, €15 for 5 and €50 for 20 tickets. 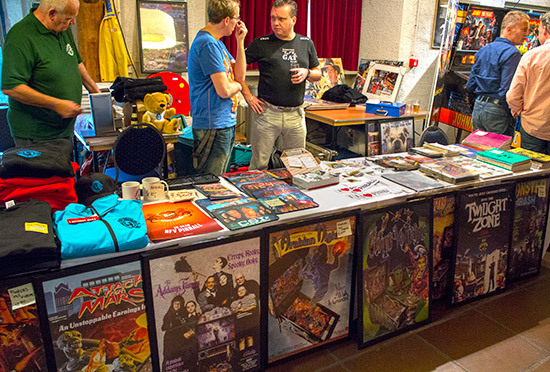 Also available to purchase at the desk was a selection of NFV apparel, posters, mouse mats, stickers, flyers, manuals, slingshot plastics, and pinball prints. Just past the entry desk was a display of a selection of the raffle prizes which would be given away at the end of Sunday. Moving into the main part of the hall, on the left was a bank of eight machines used for the Country and Ladies tournaments. Opposite them was the venue's bar where drinks and food was served. Prices were quite reasonable at €1.75 for a ham or cheese roll, €3 for a hamburger and €2 for french fries. Other traditional Dutch food items were also available, as were beers for €2 and soft drinks for the same price. Unlike previous years, payment could be made directly in cash as opposed to the coloured tokens used in Amsterdam and at other locations. 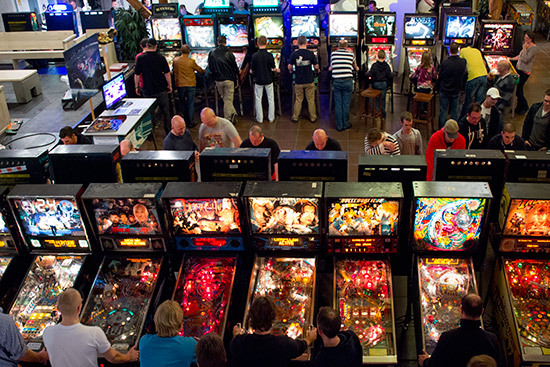 Walking past the bar and the tournament machines brought you into the main part of the hall where the free play machines were situated. Starting over on the far left wall, two rows of predominantly-DMD machines were kept busy throughout the weekend. Even machines not originally designed with a dot matrix displays seemed to have sprouted them. 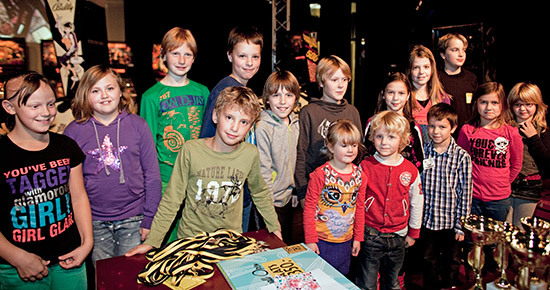 Steven started the project in August 2010 as a project at the school at which he teaches, and he was joined by Pieter at the end of 2011 to write the software and create the sound effects. The two have worked on it since then, and say they have received a number of ideas at the DPO about how to improve the game further. You can see more of this game in our video below. 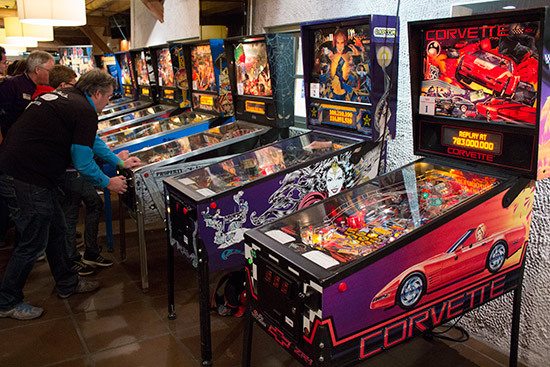 There was a mix of machines in this row, including titles such as 24, Rescue 911, Rollergames, Elvis and Metallica. 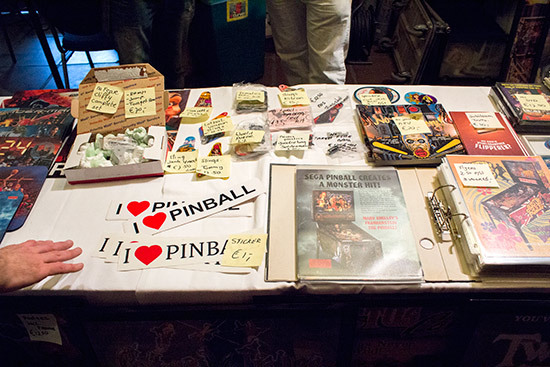 At the end of this row was the first of the vendors - Mirco Stefan's High Class Pinballs. 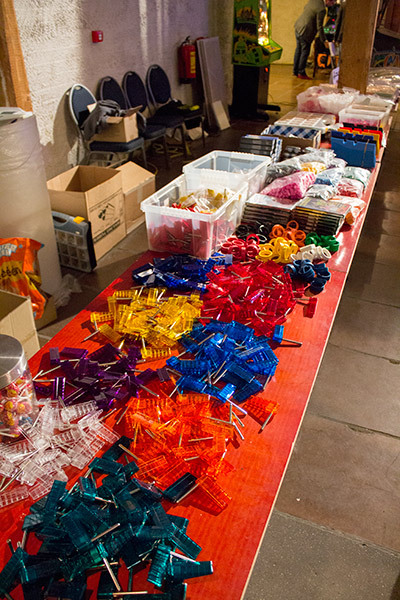 Mirco had plenty of plastic parts, lamps, coils, playfields, legs, glass edging, and cabinet decals. At the entrance to this row was Stern's latest offering - Star Trek Pro. 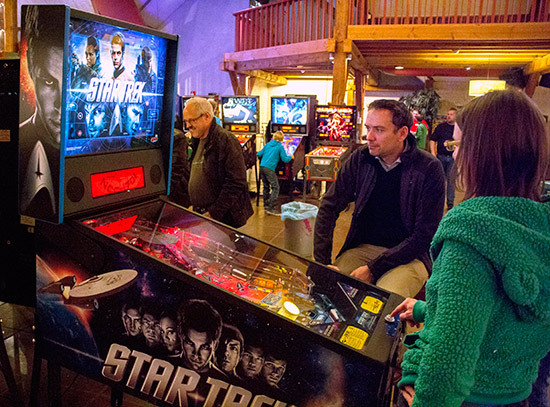 This game - like may of the most popular titles - was in constant use throughout the weekend. 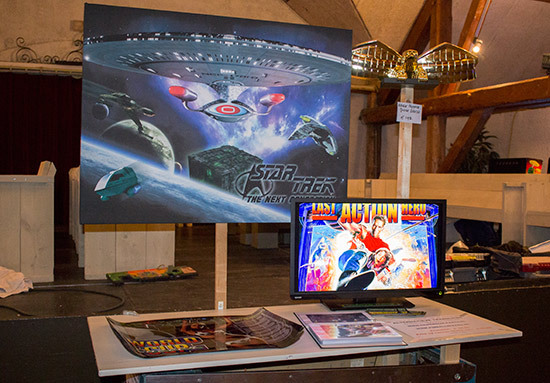 To the right of Star Trek was the central area with more machines and another vendor. At the end of this row was a display of alternative translites for a selection of titles. 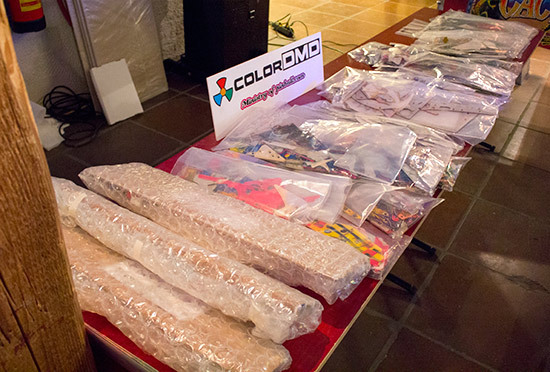 These cost €86.50 each, or could be ordered from Gameroom-Parts.nl or PinballWizard.nl. They could also be ordered as canvas prints for €98.20. 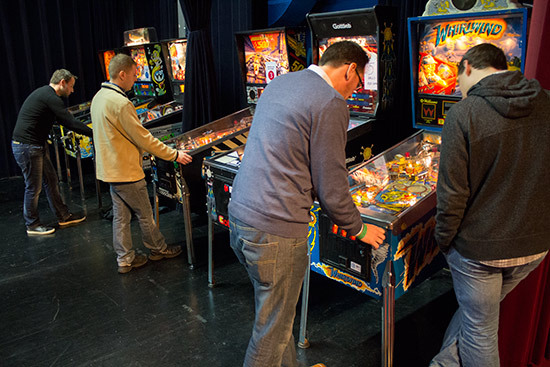 To showcase some of the alternative designs, a row of machines was fitted with the new translites. 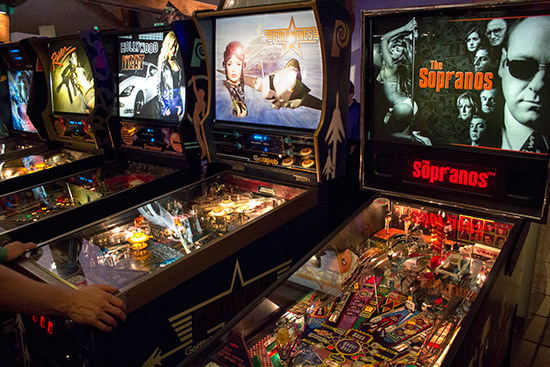 Backing on to these machines was another interesting row of games, starting with Dutch Pinball's Bride of Pinbot 2.0. 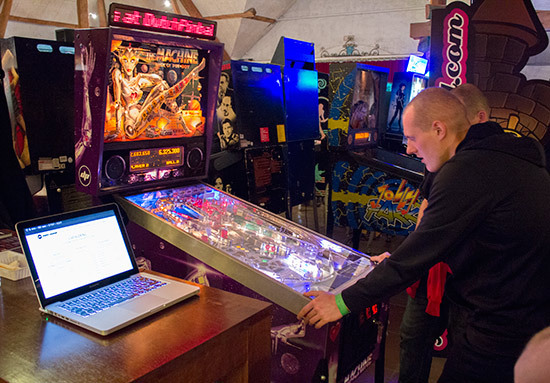 The controlling laptop was also uploading live scores to the Dutch Pinball server. 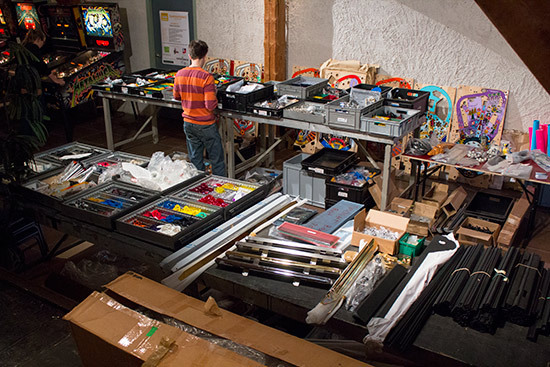 The remainder of this area was occupied by Ministry of Pinball with their display of machines and parts. 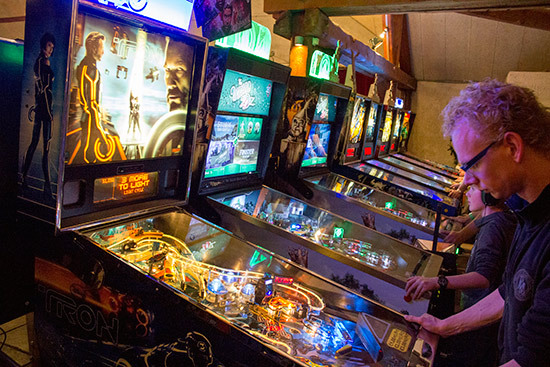 Their display consisted of new machines from Jersey Jack Pinball and Stern Pinball, as well as some beautifully restored and customised games. 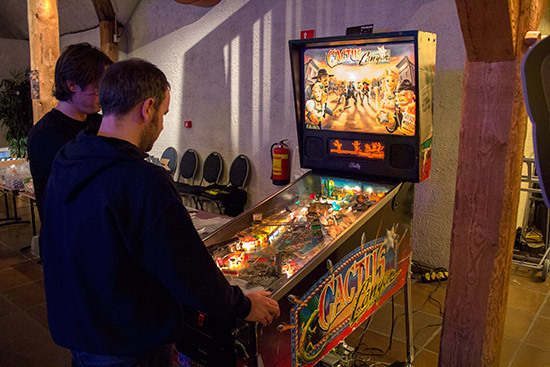 On the other side of the entrance to Ministry of Pinball was a Cactus Canyon machine fitted with a P-ROC and running the Cactus Canyon Continued software from Eric Priepke. 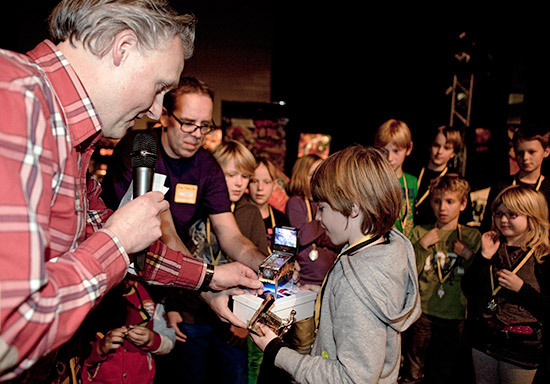 Next door was Pinnovating's The Matrix machine from Gerard van de Sanden and Dennis van de Pas. This time they had fitted a ColorDMD in green and were running the new Sigma code on it. 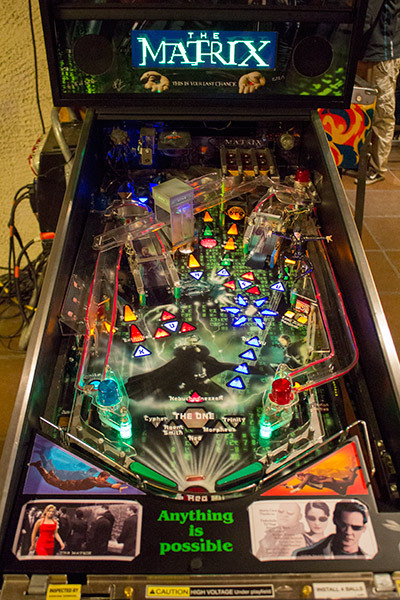 Behind The Matrix was a bank of machines used for the Classics Tournament. 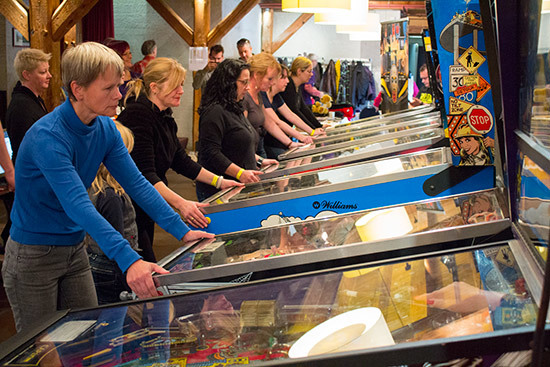 The Classic Tournament ran all day Saturday and Sunday, during which time competitors could buy as many entries as they liked. 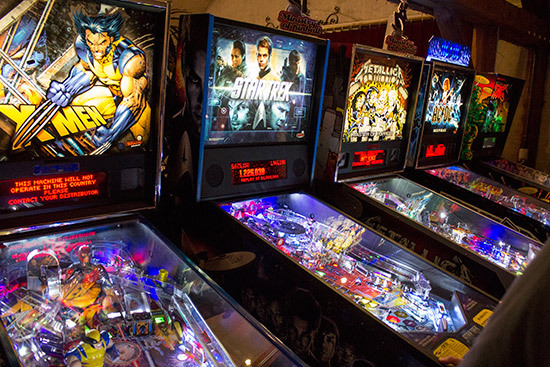 Each entry granted one play on three of the six machines. The combined ranking points from the three games made up the entry, and the player with the entry with the most points at the end of the tournament was the winner. 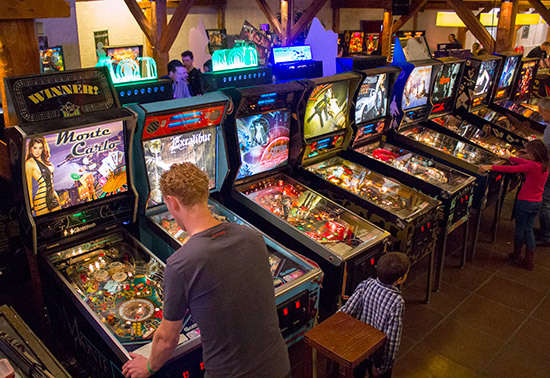 Facing the Classics machines was another bank of back-to-back free play games. 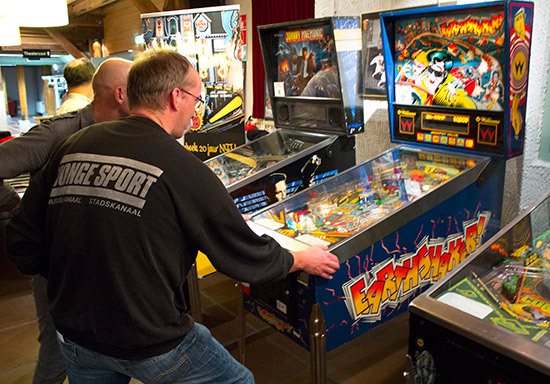 Finally in the main hall, Jonathan Joosten had a stand for his Pinball Magazine, featuring two pinball machines; Sharpshooter from Gameplan, which was designed by Roger Sharpe - the main subject of the first edition, and Party Animal which was designed by Dennis Nordman, the main interviewee in the second. Here's a list of all the machines in the main hall. 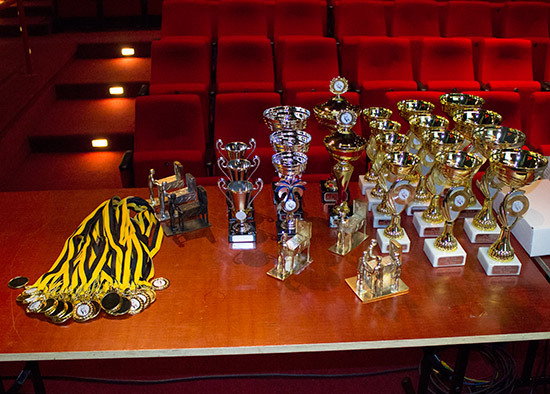 The first of the tournaments to take place was held on Saturday afternoon and evening, and was the Country Tournament. 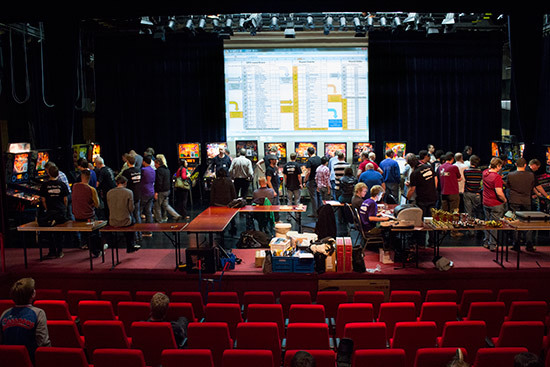 Twelve teams of four from across Europe competed in two groups of six with each team playing a match against the other five teams in their group. The first group began their matches at 11am, while the second group began at 3pm. 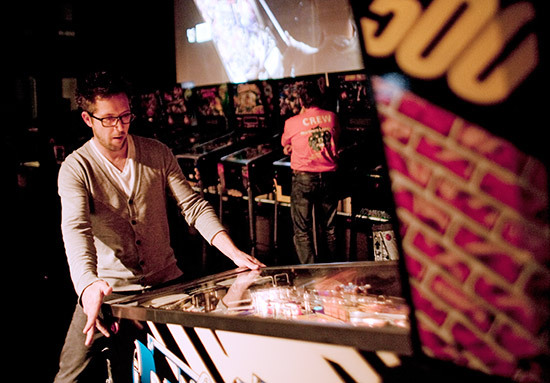 The matches consisted of four games played on two machines. 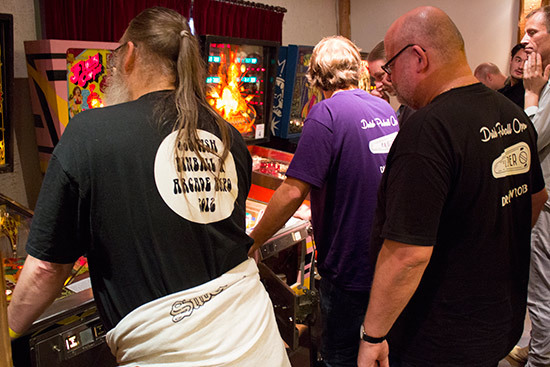 Two members of each team played split-flipper against two members of the opposition on one machine, while the remaining team members did the same on a second machine. 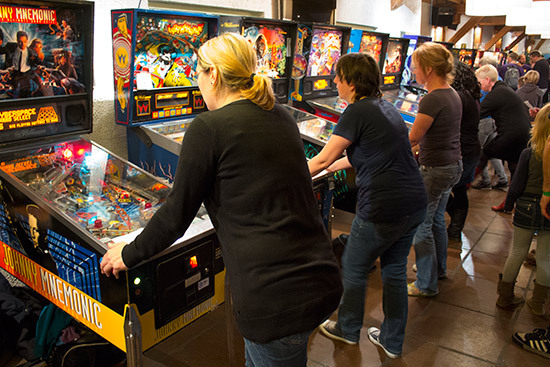 Once that was completed, the player pairs were mixed up so nobody played with the same partner, and a second pair of games were played on the same machines. If a team won three or all four of the matches, they scored two points. If it was a tie, both teams scored one point, while winning one or none of the matches scored no points. After all five rounds had been played, the two teams in the group with the most points went into the semi-finals. The Country Tournament ran alongside qualifying for the main DPO, so players had to ensure they had time to play in both. 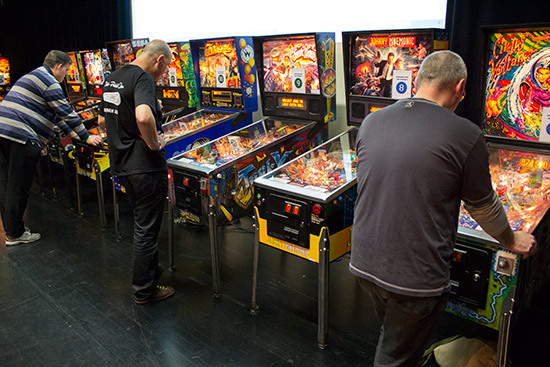 When the power for the machines in the main hall was tripped in the early afternoon, many players used the opportunity to try to play some of their DPO qualifying games. That power outage, along with the length of some of the matches, meant the Country Tournament ran later than anticipated and left some players with barely enough time to qualify for the DPO. 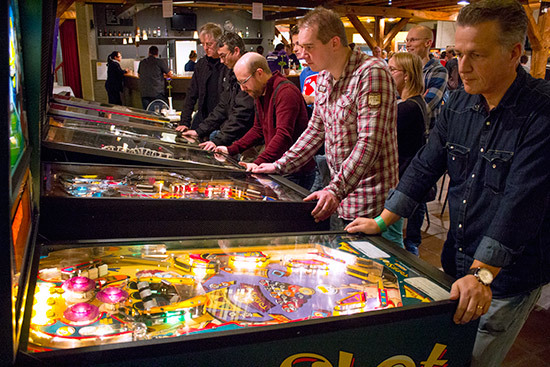 The two qualifying teams from the first group were Amsterdam Pinball Masters and Visioen, while the second group's top teams were Dutch Pinball Team and UK. These went into the semi-finals to play two two-team matches. The winner of the first group played the second-placed team from the second group, and the winner of the second group played the second-placed team from the first group. 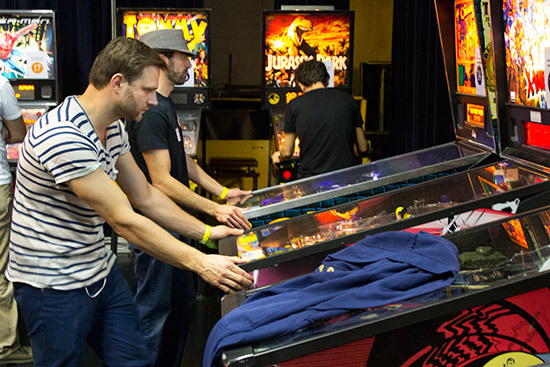 The format was the same as the group matches, except that the third and fourth games were played on two different machines. 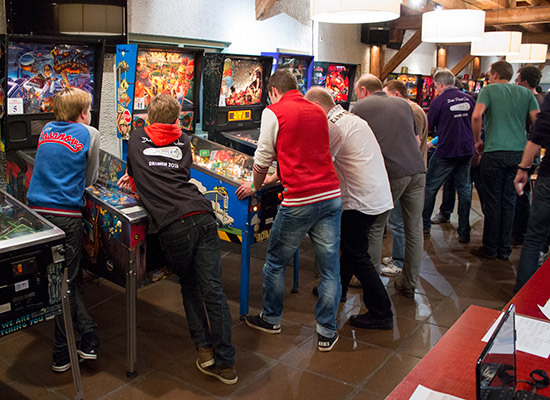 The final two teams were the Dutch Pinball Team and the team from the UK. 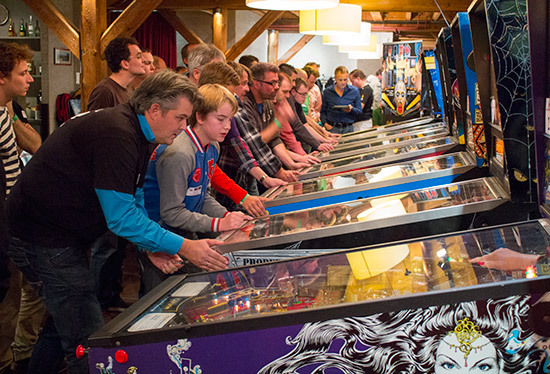 The Dutch Pinball Team won all four matches in the final, winning the Country Competition. 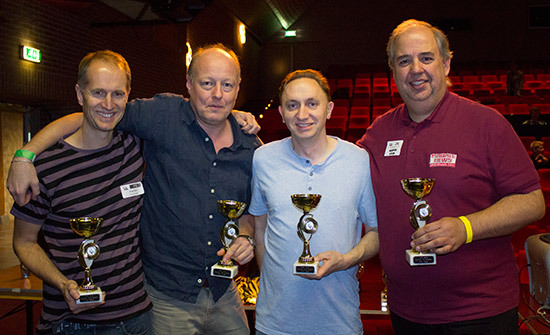 The UK team were second, and Visioen from the Netherlands were third after a play-off. 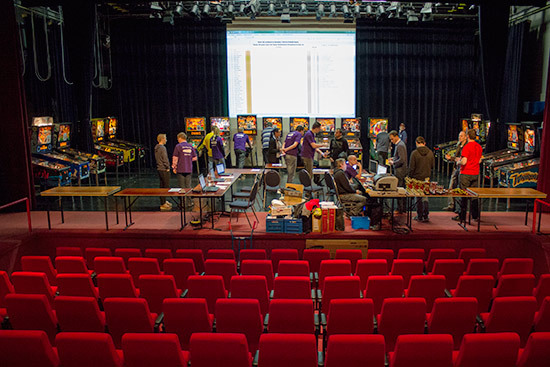 While the Country Tournament was taking place, the qualifying round of the main Dutch Pinball Open (DPO) was under way in the theatre next door. 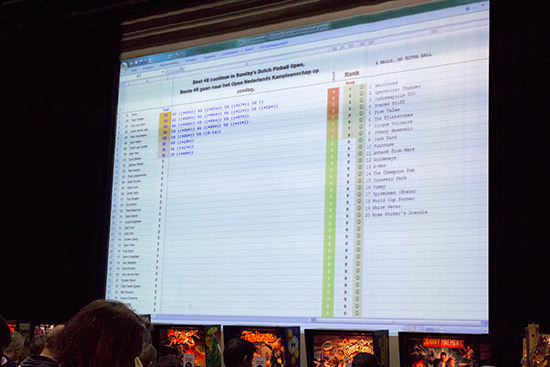 There was a large projector screen above the stage which was periodically updated to show the current standings. The top 48 players progressed to the play-offs on Sunday, with the top 16 receiving a bye through the first round of play-offs. 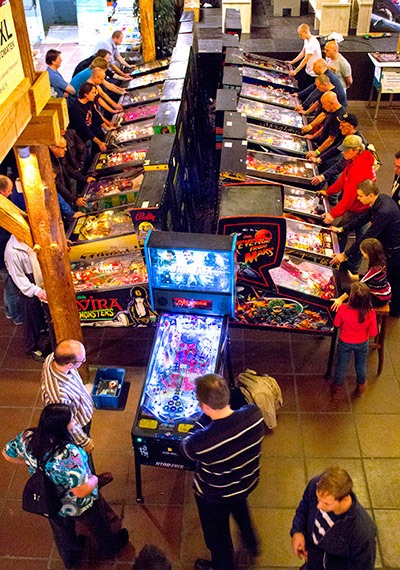 In the qualifying round, players could choose six of the twenty machines and they had a single 4-ball game on each of them. 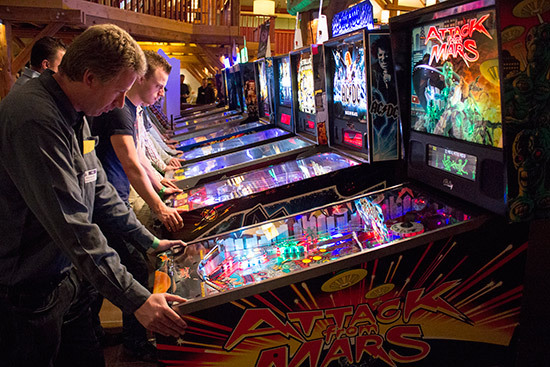 The scores on all each machine were ranked and ranking points awarded. 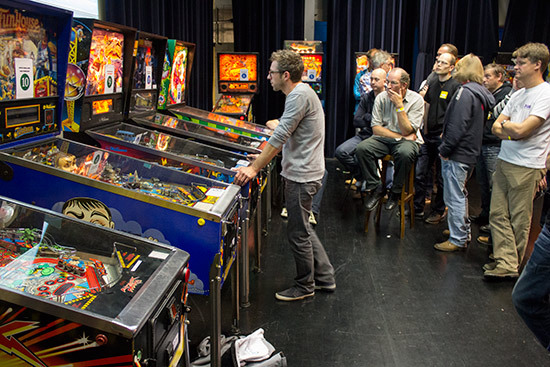 The total ranking points from their six machines made up a player's total score. 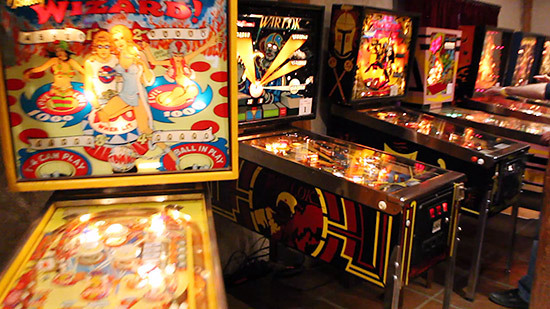 In addition, a joker could be played which allowed the replaying of one of the six machines. If the second game ended with a higher score than the first attempt then it replaced it, otherwise the original score stood. Playing the joker was not mandatory, but as it was risk free and allowed additional practice, it was usually wise to play it even if you were safely qualified. In many cases, the joker game made the difference between qualifying or not. Those who didn't qualify went no further in the DPO with their qualifying place becoming their final placing. They could then spend Sunday concentrating on other tournaments such as the Classics. Everyone else assembled at 10am on Sunday for the start of the play-offs. 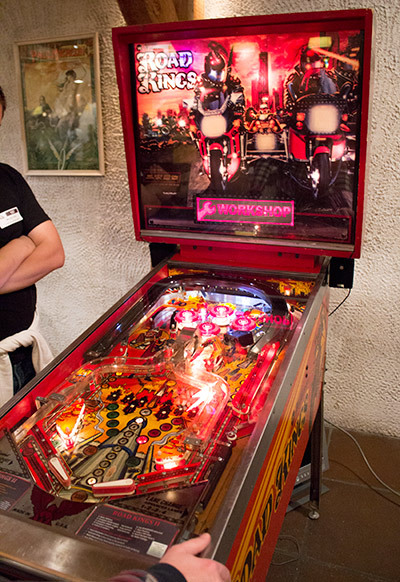 Players were drawn on random machines for best-of-three head-to-head 3-ball matches. Whoever won two games continued to the next round, while their opponent dropped down into the loser bracket. The head-to-head best-of-three 3-ball matches continued in the winners bracket all the way through the tournament, including the final. The loser bracket played a single 4-ball game on a random machine to decide who continued in the loser bracket and who was out of the DPO. As the number of survivors dwindled, interest in the last few games grew with a large crowd watching the quarter- and semi-finalists. In the end, the final was between Zach Sharpe from the US who had remained undefeated throughout the tournament, and Taco Wouters from the Netherlands who won the loser bracket. 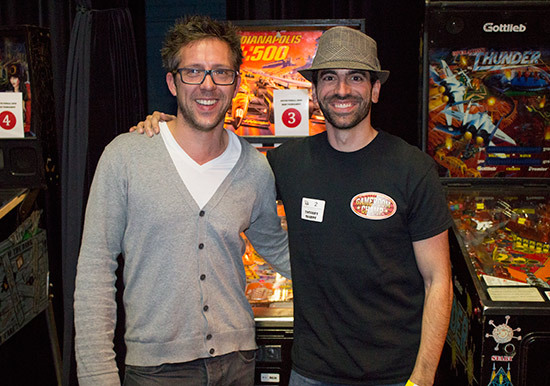 The final was another best-of-three match with both players starting equal and able to choose one of the final machines. 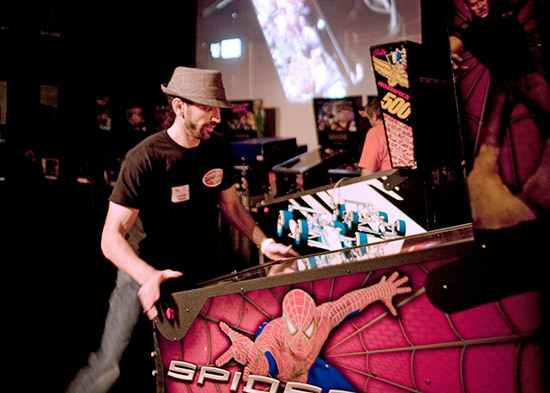 Zach chose Scared Stiff, Taco chose Indianapolis 500, and if it were needed, the deciding machine would be Spider-Man. 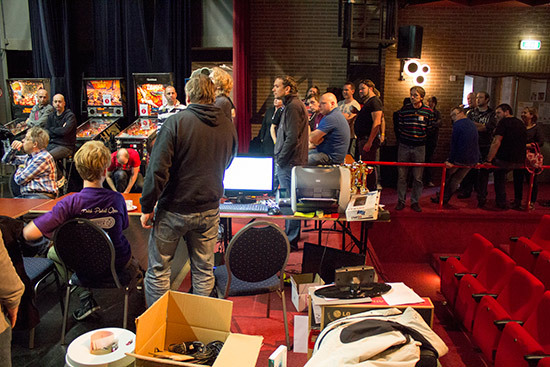 An overhead camera was set up so the action on the playfield could be shown on the large projector screen for the audience to watch. Taco's choice of machine was the first to play and despite it being his selection, he lost on Indianapolis 500. Zach's choice of Scared Stiff was next and, as with the first game, the player choosing it lost. So with the score at 1-1, the final went to the decider on Spider-Man. Zach played first and put up a total of 49M with his three balls. 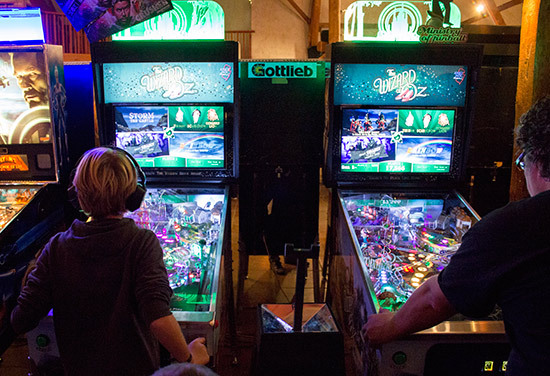 Taco had 18M going into his last ball, and despite getting Bank Bust multiball, he was only able to pull his score back to 30M, making Zach the winner. Taco was second and Lieven from Belgium third. The Netherlands' representative in the Miss World tournament, Jacqueline Steenbeek who hails from the DPO's host city of Drunen, awarded the prizes. Taco managed to go one better in the Classic Tournament which concluded on Sunday afternoon. 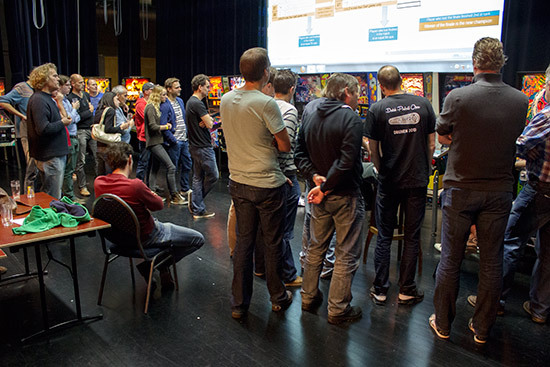 As players were knocked out of the DPO, they headed to the Classic machines to play as many entries as they could before it closed. As a result of that and the occasional machine repair, the area became rather crowded at times. Also taking place on Sunday were the Ladies and Kids Tournaments. 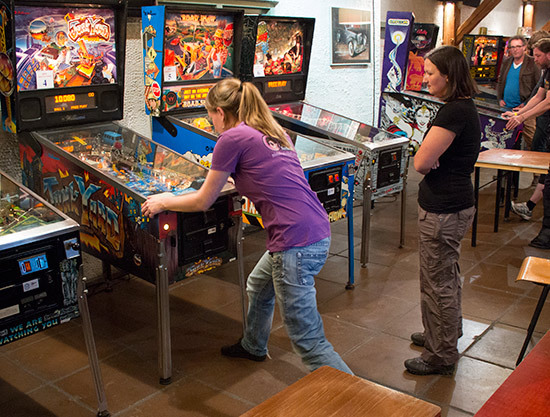 The Ladies Tournament took place on the same machines used for the previous day's Country Tournament. The final came down to a battle between Netherlands' Jasmijn de Jong and the UK's Kate Morris. 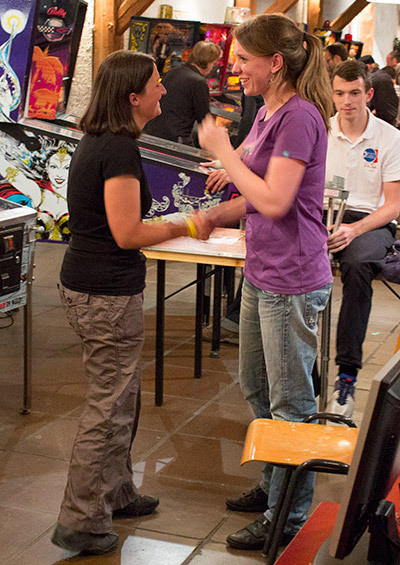 The last game of the final was on Junkyard and Jasmijn's player one score of 7.6M was good enough, as Kate could only manage 4.3M on her last ball to take second place. Machteld de Cloedt from Belgium was third. 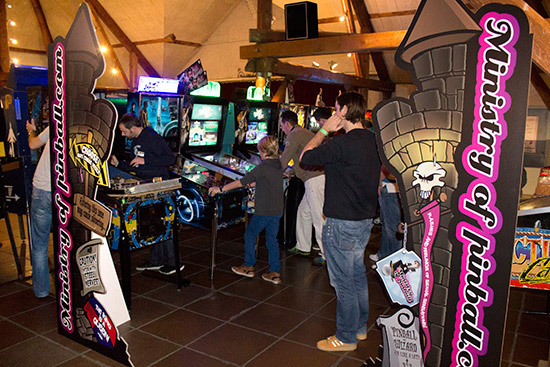 In the Kids Tournament which was played on a selection of machine near the High Class Pinballs stand, it was a win for Arthur Vissers from Breda in the Netherlands. Tom Vis was second, Luke ten Klooster was third, and Joeri van der Sanden was fourth. 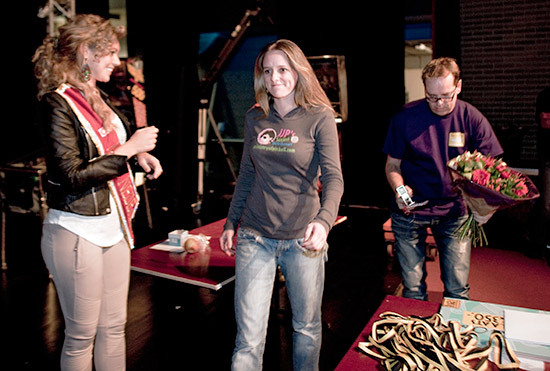 All the top four came from the Netherlands, and all competitors won a medal for taking part. 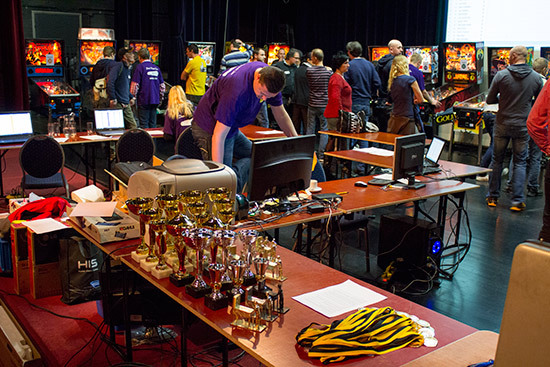 The tournament and raffle results bring us to the end of this report from the Dutch Pinball Open 2013. Visitors to the event were impressed by the venue and the amount of space available. It is unfortunate that the DPO has to keep moving around the country as we'd very much like to return here for next year's DPO. 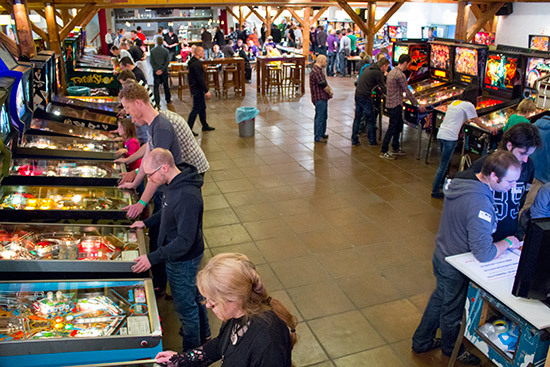 The selection and quality of the machines in the main hall was excellent, with a nice display of Gottlieb/Premier titles and the latest releases from Stern and Jersey Jack Pinball alongside custom games such as Bride of Pinbot 2.0, The Matrix and Road Kings 2.0. There was one power outage on Saturday which lasted for five minutes but only affected the main hall. The Country Competition was already running late and this didn't help as all games in progress had to be restarted. The knock-on effect was to make it difficult for some players to complete all their DPO qualifying games in time. The other noticeable omission was status displays showing how the tournaments were progressing. The Classic especially suffered from this, but the paper scoring used for the DPO also meant qualifying positions were only updated occasionally and the qualifiers weren't confirmed until some time after the qualifying ended. The play-offs all went smoothly though, and the setting for the final with the overhead camera projected on the large screen allowed everyone in the audience to enjoy it. 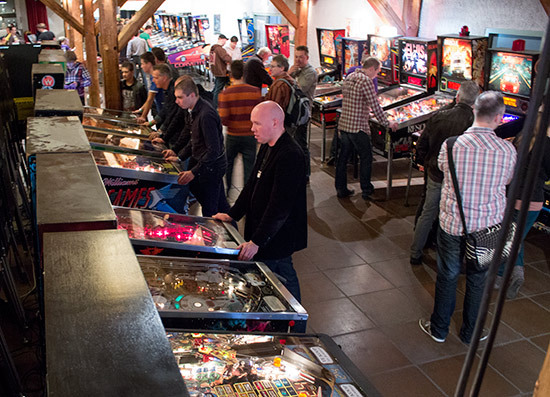 So we will end with our exclusive Eight Minute Tour of the Dutch Pinball Open 2013 shot on Saturday afternoon.